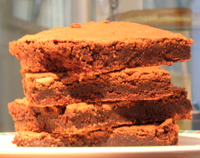 I am giving away the fact that I grew up in the US by my love of brownies. The brownies here in Ireland tend to be way too fluffy instead of being dense and decadent, and sadly people often use poor quality chocolate. The fluffiness is no doubt due to the flour. It astonishes me that it is next to impossible to get flour without rising agents in Irish supermarkets. Even most “plain flour” is anything but when you peruse the ingredients. In my mind, plain flour would suggest one ingredient – flour, but that is not the case (look!). 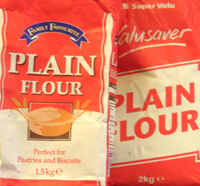 Of course commercially there is a great range of flour options but in supermarkets we have just found two flours that are simply flour – Family Favourite Plain flour from Lidl and Supervalu’s Valusaver Plain Flour. So check your flour ingredients list (how strange it is to say that!) and make sure it says nothing more than flour if you want to avoid the brownies rising more than they will naturally with the eggs. The same goes for the chocolate chip cookie recipe I gave here earlier. 8. 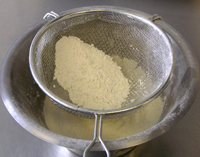 Pour the batter into the prepared pan, and bake just until cooked, 25 – 30 minutes (a knife should come out clean). 9. Allow the brownies to cool slightly. Then cut them into squares and transfer to a wire rack to cool completely. 10. 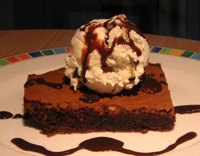 Serve with ice cream and chocolate sauce for a truly decadent dessert! That’s really interesting, Kieran – I thought that it was only self-raising flour that had raising agents in it. Must go home and check out the bags of flour that I have in the baking cupboard! Your brownies look fab. Do you sell these in the shop too? Why on earth do they put raising agents in plain flour?! I don’t think you can use strong flour for cake baking though. It would be for bread and pizza doughs. Today I found another additive-free plain flour: St Bernard’s in Dunnes. I use Odlums Unbleached Flour which has no raising agents but isn’t available everywhere. It’s a bit more expensive but worth it. eh..do you need self raising flour like??????????????????? Thanks for the tips on other brands. I nearly lose my mind every time I have to buy flour and now my local SuperValu doesn’t seem to have “real flour” anymore. There’ll be no Christmas baking if I don’t find some soon. I only recently discovered this website, I made the chocolate chip cookis & they came out great. Absolutely gorgeous.. & that was before they even made it into the oven. I am going to make the brownies & was just wondering where I would get natural vanilla. I have vanilla extract – is it ok to use that instead & if so how much?? Just to let you know, I found another brand of flour which has no raising agents. It is available in Superquinn, and the brand has pictures of Wallace and Gromit on the packs. It’s organic, so a bit more expensive, but it has worked well in my experiments with this recipe. Kieran, tablespoons of vanilla? Really? Seems a little excessive to me….still I’ll know sometime later this evening I guess. I checked the vanilla, and it’s right. With all the chocolate in there, you need a good bit… Hope they came out well.